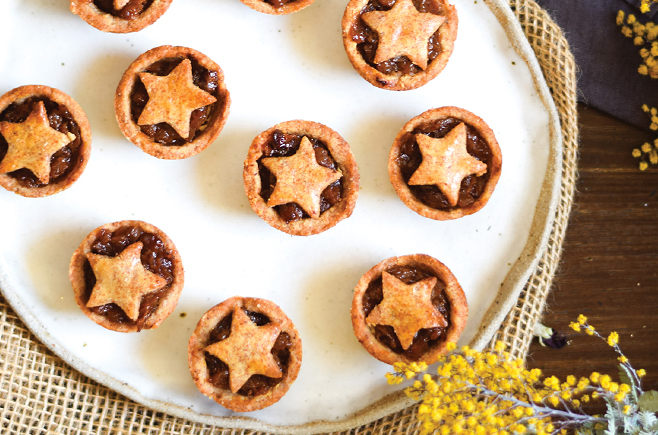 These low-carb mince pies are the perfect end to the Christmas meal or just as a treat with only 4g carbohydrate per serve. The fruit mince tastes even better if made a week before and refrigerated ready for use. Freezes well. Lovely served just warm. Ensure the cream cheese is at room temperature. Combine 2 teaspoons of orange zest with all the other ingredients and mix until a firm dough is formed. Roll out thinly between two sheets of baking paper and allow to rest. Place a teaspoon of orange zest and the remaining ingredients, except the brandy, in a saucepan. Cover and simmer over a gentle heat for about 60 minutes, stirring frequently to ensure the mixture does not stick to the bottom of the pan. Remove from the heat, drain and add the brandy. Allow to cool. Refrigerate at this point if making ahead. Mix the remaining teaspoon of orange zest with the cream cheese until it is smooth and set aside. Grease the pie tins and cut the pastry into circles large enough to line the tins. Place ½ teaspoon of cream cheese mixture into the bottom of each tin and then fill to the top with the cooled fruit mince mixture. Cut out the remaining pastry to form a star on the pies. Bake in the oven for about 30 minutes until golden brown. Cool before removing from the tins. Store in an air tight container. This gluten-free recipe is from the new cookbook: carbs by numbers low carb recipe options – Christmas by Sandra Dunbar and Meg Pell.